Teaching handwriting to young children can seem like a larger than life task both for the teacher and the parent. The Reggio Emilia approach recognizes that every child is capable, independent, and full of imagination. It is imperative that each child be encouraged and motivated to question, investigate, and explore the world around them and handwriting should be taught in a way that mirrors these values and principles. 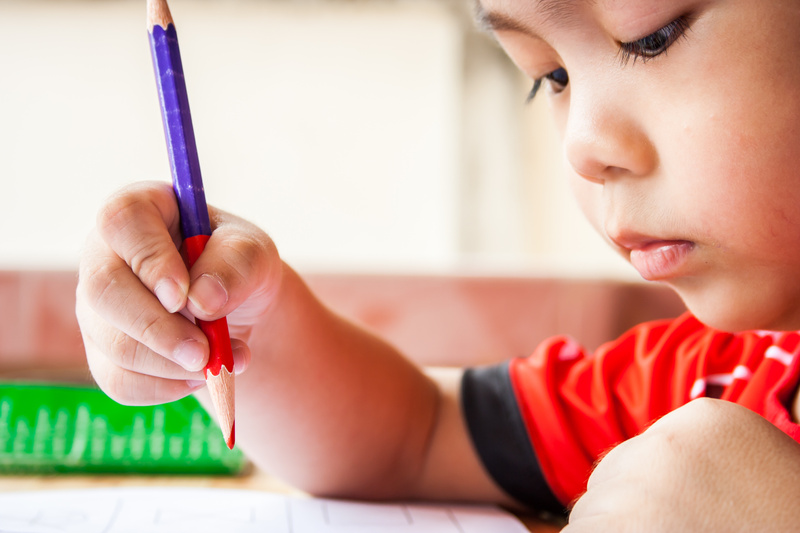 A multisensory approach to teaching children how to write is important in providing developmentally appropriate lessons on letters and handwriting. This approach is beneficial because it appeals to all learning styles and most activities and materials can be used both inside and outside of the classroom. There are four approaches to the multisensory way of learning handwriting: visual, kinesthetic, auditory, and tactile. An educator’s teaching should incorporate the four approaches at various times while making it engaging, exciting, and interactive for the child. The visual approach uses large, step-by-step directions, which could involve a blackboard or large paper on an easel. The educator should demonstrate how to write the letter using easy to follow movements while the child follows along. The kinesthetic approach uses body movement to help develop motor memory. Hands-on activities such as air writing and tracing letters are great ways to use this approach. The auditory approach should include music, singing, rhymes, or various voice tones to teach how to form letters. Lastly, the tactile approach utilizes various textures and materials to form letters. Children can use materials that are found in all classrooms, such as clay and string. Since a Reggio Emilia environment is viewed as the “third teacher” it is essential for children to be surrounded by a literacy-rich environment full of words, letters, books, and related activities. The materials used to teach handwriting can vary from wood pieces and play dough to mini chalkboards and writing trays. These materials are not only engaging, but they also promote the hand coordination and strength necessary when writing. Letters should be introduced to children in a developmentally appropriate way so confidence can build with each letter learned. In order to do this, groups of letters should be introduced at varying times. Incorporating song, dance, and other forms of movement and object manipulation adds even more to their learning process. Documentation is another important aspect that allows parents, teachers, and children to see their progress and growth. Notebooks or portfolio binders are great tools to keep their child’s hard work in one place and it’s very easy for everyone to see their handwriting progress! Imagine this…. children walk into their classroom in the morning and trace the first letter of their name on a chart in order to “sign in” each day. ; they look forward to their birthday when they get to decorate a wooden letter that their name begins with; they create letters with twigs and leaves after a class nature walk in the fall; they shape letters using play dough; or write letters in colorful sand using a paintbrush and a writing tray. Working together, children can create the alphabet using materials found throughout the classroom and in their surrounding environment! Lead by example and show your child that you write too! The key take away is to use engaging ideas and materials to promote curiosity and exploration in young children with letters and handwriting! Interested in learning more about how The Compass School encourages children to learn handwriting skills? Learn more by clicking HERE!